In Gmail, replies to original email message are grouped together creating a single conversation or thread. Replies and related messages are stacked upon each other like deck for cards (and is also called conversation view). This allows you to easily follow all replies to specific email message at the same place without checking inbox individually for each email reply. Besides conversation or thread view, other email services display each email reply as separate message in the inbox. They do not group replies to specific email message into original parent message or display it as single thread of messages. 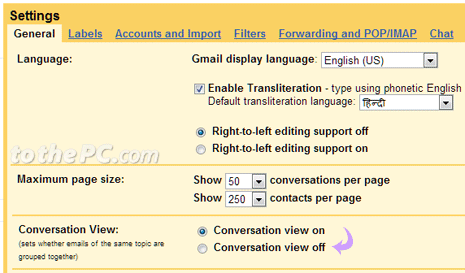 You can easily turn off conversation view in Gmail settings and get each reply listed as separate message in the inbox. 1. Login into Gmail account and click ‘Settings’ at the top right. 2. On ‘Settings’ page under ‘General’ tab look for ‘Conversation View’ option. Click to select ON or OFF option for ‘Conversation View: (sets whether emails of the same topic are grouped together). 3. Then click ‘Save changes’ button at the bottom. 1. To view all messages in a conversation or thread, click Expand all button. It will display original message and received replies in neat chronological order. 2. A conversation will break off into a new thread if the subject line of the conversation is changed or if the conversation reaches over 100 messages. Gmail Stickers, splash & stick Gmail everywhere !